Picturesque Richmond Texas lies close enough to Houston for residents to pop in and enjoy everything that bustling metropolis has to offer, and yet far enough to still keep a small city, laid back fee. Rich in Texas history, Richmond is home to some gorgeous historic homes and attractions such as the the 1908 Historic County Courthouse, the 1883 Home of Congressman John M. Moore and the Long-Smith Cottage on the grounds of the Fort Bend Museum. We create custom designed stained glass for the homes, businesses, and churches of Richmond Texas. These custom designed windows and door panels can be done in any style, from an antique replica style that would match perfectly in the historic homes of Richmond’s founders to the most modern and contemporary style building. Our designers work together with each client, one on one, to create patterns and designs that not just meet their needs, but satisfy their tastes as well as complement the décor of the room or even the period of the architecture. Some of our most popular custom stained glass designs include antique style, Art Deco style, Art Nouveau style, Celtic style, Frank Lloyd Wright style, Mission style, Prairie style, Beveled and leaded glass style, and so many more. If a client has a favorite stained glass designer, such as Frank Lloyd Wright or Greene and Greene, we can always design something inspired by that artist’s work, with the same look and feel. When it comes to our residential stained glass, many clients prefer leaded stained glass without color, for a more subtle, elegant look. 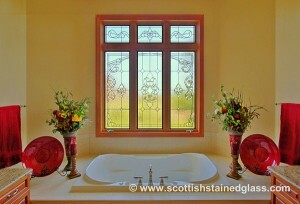 This style goes with any color scheme and is fantastic for adding privacy in a home’s entryway or bathroom windows. It is also wonderful for blocking a not so appealing view and replacing it with a beautiful piece of glass art, such as in the well windows of a beautifully finished basement. For our commercial stained glass customers, we make any style, any colors, any sizes. 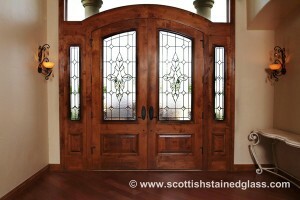 Stained glass sets a mood or ambiance that the business’s clients will remember and want to return to. Options for commercial stained glass include the usual windows and doors, and more unusual ideas such as stained glass signs and hanging panels, stained glass skylights and ceilings, and stained glass lighting. We work together with each business to design the styles and designs that will take their interiors to the next level. Our religious stained glass art can be the most traditional, featuring scenes or figures from the Bible, or it can be more modern and of a less literal mien. We are always honored to produce stained glass windows or doors for chapels, cathedrals, temples, or churches of any denomination. Please contact us today for more information or to set up an appointment with one of our design professionals.